U.K. in Crisis: Facing No Deal, Parliament Votes on Brexit After Rejecting May’s Plan for Third Time | Democracy Now! 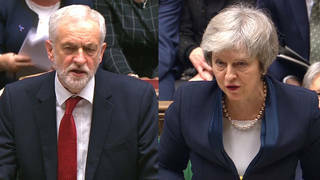 AMY GOODMAN: We begin today’s show with the ongoing political chaos in the United Kingdom, where Parliament is preparing to vote today on a series of options for exiting the European Union, after rejecting Prime Minister Theresa May’s Brexit plan for the third time Friday. Friday was supposed to be the day the U.K. left the European Union. Now the exit date is set for April 12th. With the deadline fast approaching and still no deal, Parliament is scrambling to come up with a deal backed by a majority. Among the options on the table are remaining in the EU customs union, a soft Brexit and a second referendum—all ideas Prime Minister May has rejected in the past. This is May speaking Friday after her deal’s defeat. PRIME MINISTER THERESA MAY: The implications of the House’s decision are grave. The legal default now is that United Kingdom is due to leave the European Union on the 12th of April, in just 14 days’ time. That is not enough time to agree, legislate for and ratify a deal, and yet the House has been clear it will not permit leaving without a deal. And so we will have to agree an alternative way forward. The European Union has been clear that any further extension will need to have a clear purpose and will need to be agreed unanimously by the heads of the other 27 member states ahead of the 12th of April. It is almost certain to involve the United Kingdom being required to hold European parliamentary elections. On Monday—on Monday, this House will continue the process to see if there is a stable majority for a particular alternative version of our future relationship with the EU. Of course, all of the options will require the withdrawal agreement. Mr. Speaker, I fear we are reaching the limits of this process in this House. This House—this House has rejected no deal. It has rejected no Brexit. On Wednesday it rejected all the variations of the deal on the table. And today it has rejected approving the withdrawal agreement alone and continuing a process on the future. This government will continue to press the case for the orderly Brexit that the result of the referendum demands. Well, for more, we go to Cambridge, England, where we’re joined by professor Priya Gopal. Professor Gopal is a university lecturer in the Faculty of English at the University of Cambridge. AMY GOODMAN: —explain what was voted down on Friday, and then talk about what’s happening today. And we’re having another vote this evening. I think there are nine options on the table this time. And again, there is no clarity as to which option will win out. Theresa May will try again to get her deal through, but it seems very unlikely that she will get the 30-odd votes that she needs to make that happen. AMY GOODMAN: Let’s go to opposition Labour Party Leader Jeremy Corbyn speaking Saturday about Prime Minister May’s handling of Brexit. JEREMY CORBYN: She was supposed to have brought the vote on December the 11th, pulled it, put it the end of January and lost by the largest-ever majority a government was defeated in parliamentary history, brought it back again, then again, and is now going to, apparently, try again next week. This is beyond ridiculous. There is a clear proposal there, that we negotiate a customs union with Europe, which will then protect the whole issue of the border in Northern Ireland, that we negotiate trade access, and above all, a dynamic protection of rights, so we don’t fall below Europe on it, because I suspect there’s a whole agenda there in the Tory Party which would want to see workers’ rights and consumer rights and environmental protections diminish. We’ll put our proposals again to Parliament next week. AMY GOODMAN: Can you talk about Jeremy Corbyn and the Labour Party’s position on this, Professor Gopal? PRIYA GOPAL: The Labour Party has six tests, which it has put in place for any deal that the EU and Britain will have. And the most important aspect of those six tests are the customs union, which Corbyn spoke about in the clip that you just aired, and the other is what they call a close relationship to the single market. Essentially, they want to keep all the benefits of being in a customs union and in a single market, without necessarily being formally in a single market. So, the Labour Party position is one that essentially wants to keep several of the advantages of being in the European Union, but ending, I think—because Britain won’t be in a single market, ending freedom of movement as it currently stands. We do know that the Labour Party Conference has agreed that if no version of Brexit passes, then there will be—there is a commitment to a second referendum. But I think currently Jeremy Corbyn is preparing for a general election, and his focus is on getting his version of a Brexit deal through. It’s one that he believes will command agreement within the EU. AMY GOODMAN: Grace Blakeley is the economics commentator at the New Statesman. Her recent column is headlined “The European project has far bigger problems than Brexit.” And she writes, quote, “For every step forward European leaders have taken since the financial crisis, they have taken two steps back. While many worry about China, slowing global growth, and a no-deal Brexit, the truly existential questions the EU faces are internal. And they are all about power. Can you comment on her comments? PRIYA GOPAL: I think that it is important to remember that there is a European Parliament and there are elected MEPs, members of the European Parliament. So I think it’s quite possible to overstate the extent to which there is no contribution to decisions made by the EU. And what we know is that the EU’s worst policies, its more neoliberal policies, have in fact been contributed to by Britain. It seems clear that the EU is a neoliberal, it is a capitalist, institution. It comes with many of the problems of contemporary capitalism and its institutions. But the question on the table, I think, is: What are the options? If you want to leave the EU, which is the sort of left, so-called Lexit, or left Brexit, position, then one would do so for something that is not neoliberal and that is not capitalist and that does allow for greater democratic say. But the options that Brexit has put forward are, I’m afraid, not that. It is a question, I think, of staying within the EU and actually being able to reform it from within, or returning to Britain, where Brexit is an extremely ideologically driven, deeply neoliberal, in some ways, free market, disaster-capitalist project. So it seems to me that there are many problems with the EU, and nobody who’s progressive can deny that there are problems with the EU. But the question is: What is the alternative? And if you leave the EU, you’re not actually doing that for greater democracy or for greater social justice; you’re actually capitulating to what is what I would definitely describe as a far-right project, both economically and socially. AMY GOODMAN: Where does Ireland fit into this picture, Professor Gopal? PRIYA GOPAL: Well, Ireland is a key question. The Irish border, the soft border between Northern Ireland and the Republic of Ireland, was a hard-won victory for the peace process. The pressure to in fact return to a hard border, from certain sections of the Brexiteering ideologues, I think, is extremely dangerous. And there are people who have pointed out—people in the Republic of Ireland who have pointed out that any return to a hard border in that region might well presage a return to something like the troubles of 30 years ago. It seems to me that there is a real lightness with which that border is being treated and that all the—I guess, the maneuverings around the backstop and the rejection of the backstop and the whole question of removing the soft border, I think, there’s a real dereliction of historical understanding about how that border came into place and what has actually resulted in a successful peace process. And undermining the Good Friday Agreement is, I think, one of the more deleterious effects of a hard Brexit. And that is something that we should all be worrying about. PRIYA GOPAL: Let me phrase this carefully. I think that any deal that Parliament comes up with today, whether that is a soft Brexit, whether that is no Brexit, whether that is a hard Brexit or whether in fact it is no deal, I think that the decision should be returned to the British people. And I say this for two reasons. I think that any deal that substantially changes Britain’s relationship with the EU should, in an exercise of democratic rights, be returned to the people for a vote. I also say it because I think there are very serious questions about the Leave campaign’s role in the first referendum, and there are questions about the extent of disinformation and extent of electoral problems, you know, to put it very mildly, were electoral—breaking of electoral regulations by the Leave campaign in the lead-up to the 2016 referendum. So it seems to me quite important to take these, essentially, life-altering decisions back to the British people. AMY GOODMAN: There were hundreds of thousands, perhaps a million, people on Saturday in London pushing for a second referendum, who went out into the streets, one of the largest mass demonstrations ever held there. What exactly now would it mean if there was this second referendum? How would it go forward? PRIYA GOPAL: There are obviously question marks about that, and it isn’t very clear exactly what the questions would be and whether the questions would be simply asking for an opinion on any deal that was proposed or whether it would also include the position of remaining, of continuing in the European Union by revoking Article 50. It seems to me that any referendum now should lay out a range of options, voting on a deal and also giving people the option of remaining in the European Union. Six million people have signed a record-breaking petition asking for Article 50 to be revoked. Now, obviously, that can’t be done on the basis of a petition, but it suggests that there is a strong-enough feeling in this country that the decision of 2016 needs to be rethought in the light of new information and in the light of what is essentially a failed negotiation process by Theresa May’s government. So, given that there is a move towards changing the referendum outcome of last time, I think it is something that must be put back to the people. AMY GOODMAN: Finally, what do you think the media should be asking right now? PRIYA GOPAL: I think that the media needs to ask two things. I think it needs to ask tougher questions about how the referendum of 2016 was conducted. It needs to—you know, really, it should have, by now, asked more probing questions about the kinds of misinformation that were circulating by the “Leave” campaign in the lead-up to that referendum. It should also be asking questions—and I’m very surprised that this is not being done—we know that the Electoral Commission has fined the Leave campaign for violations of electoral law, and the Leave campaign has essentially accepted that fine and is going to pay it. Now, this is quite serious. We now have Electoral Commission’s judgments that there were electoral process violations by the Leave campaign. We also know that some of the key funders of the Leave campaign are under investigation by the police and by the National Crime Agency. So, again, as in the U.S. situation, there are questions about where the money came from, who used the money, whether there has been interference from outside, and what kinds—and potential criminal violations. And it seems to me that the media really ought to be pursuing these questions with much greater vigor than they have been so far. AMY GOODMAN: Priya Gopal, we want to thank you for being with us, university lecturer at the Faculty of English at the University of Cambridge. We will continue, of course, to follow what happens with Brexit, with the votes later today. This is Democracy Now! When we come back, what’s happening at the border and President Trump’s threats to close the border and cut off funding to the Northern Triangle countries. Stay with us.